Bwindi Impenetrable National Park Species. There are about 11 species of Primates, including Chimpanzee, La-Honest, Red‐tailed and Blue Monkey, Black and White Colobus, Olive Baboon. Bwindi particularly is home to 360 Mountain Gorillas, approximately more than half of the total remaining world population of 700. There are 346 species of Birds recorded (Bwindi contains 90% of all Albertine Rift Endemics, difficult to see in any other place in East Africa) and 200 of Butterflies. Mammals count only 30(Buffaloes, Leopards, Elephants). There are 324-recorded species of trees. 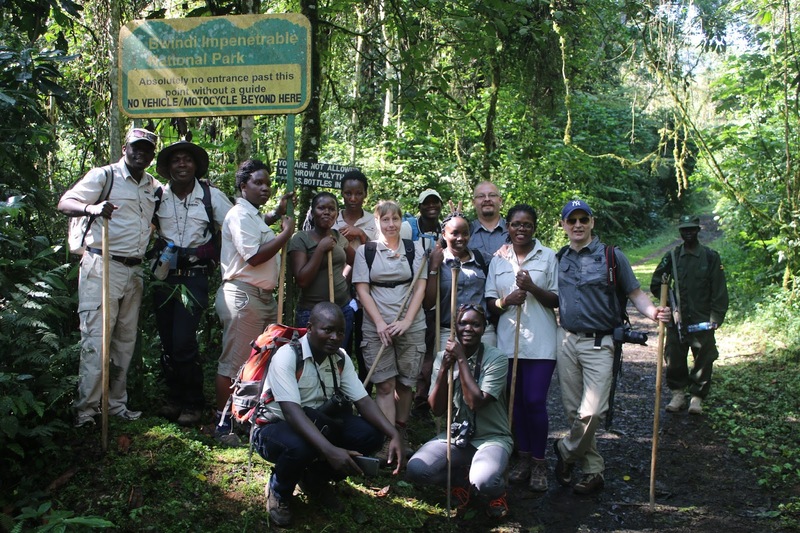 Bwindi Impenetrable National Park Activities and Attractions: The main activity is "Gorilla Tracking” to the habituated families of Mountain Gorillas. Hiking trials are open to people to view Birds, Butterflies, Primates and Tree species along the Munyaga Waterfall, Rushura, River Ivi and Bamboo zone trials. Specially recommended for Bird watchers and enthusiast are the River Ivi and Mubwindi Swamp Nature Walks. Cultural walk to Buhoma community Village, traditional homesteads, the local healer, the banana brewing, handicrafts and a cultural performance.